Toronto Real Estate Blog - GTA News : Rare Opportunity To Own This Upscale Corner Unit!! Absolutely BEAUTIFUL Downtown Toronto Loft! Rare Opportunity To Own This Upscale Corner Unit!! Absolutely BEAUTIFUL Downtown Toronto Loft! Richmond/Spadina, Toronto - Rarely Available, South Facing Very Private & Bright Corner Loft In A Boutique Building. 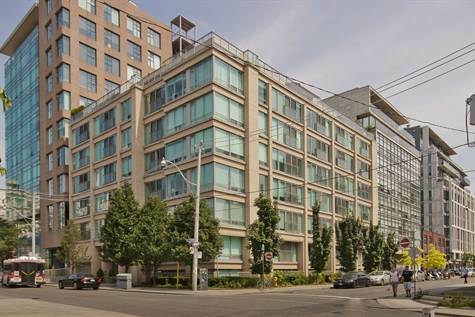 Prime Downtown Location Near The Park, Fashion & Entertainment Districts! Beautiful Unobstructed City & Cn Tower Views! 750 Square Feet Open Concept With Juliet Balcony, Wall Of Windows With Uv Custom Blinds, Custom Built-In Shelves, Central Vacuum, Stainless Steel Gas Stove. Large & Stylish Bathroom With Mosaic Tile Wall & Marble Floor. Bedroom With Walk-In Closet & 4 Piece Ensuite. Move In & Enjoy! Extras:All Stainless Steel Gas Stove, Built-In Microwave/Convectional Oven, Built In Dishwasher, Fridge. Washer/Dryer, All Blinds, Electrical Light Fixtures,Central Vacuum, Built-In Desk & Shelves. Low Maintenance Fees! Prime Parking Spot On 1st Level & Locker. Well Managed Building! Looking to Purchase a Condominium in Toronto? Not Sure Where to Start? There are a lot of Developments - Which One is Right for You? Need Space - Looking for Top of the Line Amenities - Looking for Good Management with Low Maintenance Fees? If you have a Real Estate Question - We Have the Answers. No Question too Small! Call our Office and Ask one of our Top Professionals – It’s Our Pleasure to help!